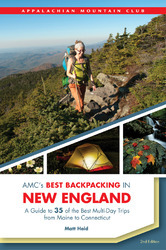 AMC's Best Backpacking in New England, by Matt Heid, 2nd Edition, 2014. New edition of unique guide to 37 multi-day hiking trips across New England. Thoroughly researched and well-written. Includes detailed descriptions of trips through such fine areas as Baxter State Park, the Pemigewasset, Sandwich Range, Presidential Range-Dry River, Great Gulf, Caribou-Speckled, Wild River, Lye Brook, Breadloaf and Glastenbury Wildernesses, Mahoosuc and Bigelow Ranges, Mt. Greylock, and even Cape Cod. 336 pp., 6" x 9".